When it comes to healthy skin proper hydration is needed. Part of most skin care regimen is using a moisturizer to hydrate the skin thus maintaining its suppleness while preventing premature skin aging. One top skincare product to consider is OZ Naturals Hyaluronic Acid Serum which is a good choice when it comes to hydrating the skin and easing out the signs of skin aging. What is OZ Naturals Hyaluronic Acid Serum? OZ Naturals Hyaluronic Acid Serum is a product based on scientific studies that can promote healthy skin. It is formulated with natural potent ingredients adhering to vegan standards that promise to provide hydration and plumping effect to decrease the appearance of signs of aging while keeping the skin properly moisturized. It comes in non-greasy and lightweight serum form that can be absorbed by the skin quickly. It contains a high dose of vitamin C and anti-oxidants to effectively work on keeping the skin healthy and youthful. The key ingredients in oz naturals hyaluronic acid serum are carefully selected to provide an effective skin care product that has many benefits. Sourced from an Indian plant seed called Cassia angustifolia, hyaluronic acid is naturally produced organic extract that is capable of holding as much as 1,000 times moisture from water. Its primary task is to hydrate and at the same time moisturize the skin penetrating deeply into the skin cells for effective nourishment. It eliminates dryness from the skin while maximizing moisture. 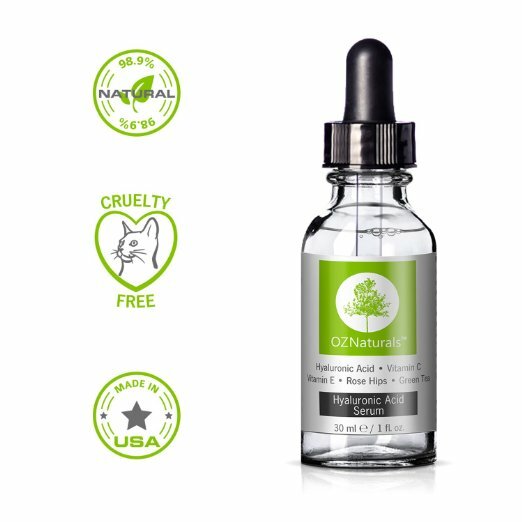 This vegan and GMO-free OZ naturals hyaluronic acid serum contains a high level of quality vitamin C. Popularly known as a potent antioxidant; vitamin c serum provides a good defense against free-radicals, pollutants, irritants and environment factors. Also known to aid skin in the healing process, vitamin C can help even out skin tone, diminish blemishes and provide a fairer appearance. Another amazing action of vitamin c is its ability to facilitate collagen production which is essential in maintaining supple and firm skin. Vitamin E is an excellent antioxidant that can naturally heal and protect the skin. Nourishing vitamin E works on a cellular level by penetrating the epidermis skin level repairing damaged skin tissues, acne, scars and fine lines. It can also help improve blood circulation and will help build stronger capillary walls. Vitamin E has a natural anti-aging property that facilitates quicker cell regeneration for younger looking skin. Known as a potent antioxidant wild craft green tea extract provides protection in the skin cellular level. It has an anti-inflammatory effect thus reducing swelling and skin puffiness. Green tea can also reduce the risk of skin cancer and helps in preventing collagen breakdown. It can also protect the skin from harmful UV rays. Who should use Oz Naturals Hyaluronic Acid Serum? Oz Naturals Hyaluronic Acid Serum is recommended for adult people who value good skin at any age. Generally, it safe to use by any adult and can be an ideal skin care product especially for individual who has maturing skin, acne problems, fine lines, eczema, uneven skin tone, blemishes, sun damaged skin and wrinkles. People with dry skin can also benefit from oz naturals hyaluronic acid serum. Does Oz Naturals Hyaluronic Acid Serum really work? With a proven formulation utilizing the best natural ingredients including potent antioxidants and vitamins oz naturals hyaluronic acid serum is an effective all-in-one skin care product. Unlike ordinary anti aging serums this breakthrough skincare product combines the best of nature and science. With potent antioxidants such as vitamins C and E plus hyaluronic acid one can experience favorable results. What is nice about oz naturals hyaluronic acid serum is that can be worn under make-up and it is best for all types of skin. It is suggested to begin using this product once a day before bed time initially for the first two weeks. On the third week the serum can be used once in the morning then after going to bed. Wash and pat dry the skin then put on toner before applying the serum. Dab a small amount onto the face and neck area and distribute it evenly. Allow to dry for a few seconds then follow up with a good moisturizer. 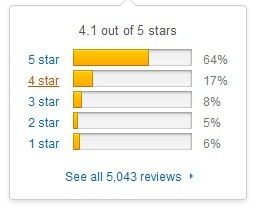 Optimal results are visible after 30 days of regular use. As a good quality hyaluronic acid serum product OZ Naturals has no reported undesirable side-effects. Some users observed a slight flaking on their skin which is but natural since the product promotes gentle skin exfoliation as it facilitate new cell growth. Dry and old skin will be eliminated in the process and a new softer and firmer skin will be revealed. Many verified Amazon users are reporting positive results upon using this popular anti aging serum on their skin. Some users even reported visible positive changes in as little as one week and many users are already hooked on using this product regularly since they are glad that their fine lines are decreasing and wrinkles are more and more less noticeable. 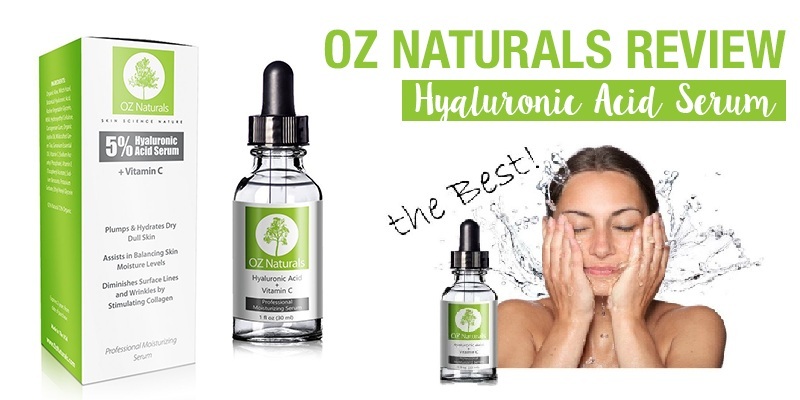 Overall from the oz naturals hyaluronic acid serum customer reviews reveal that most users are truly satisfied with this anti aging serum product. Where to buy OZ Naturals Hyaluronic Acid Serum and what is the price? 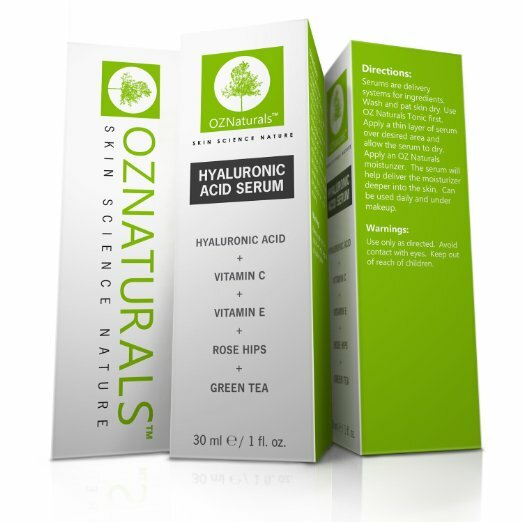 Buying oz naturals hyaluronic acid serum is easy online since they have their own website. It is also available on Amazon at $15.79 per 30 ml. bottle that comes with 30-day money back guarantee.